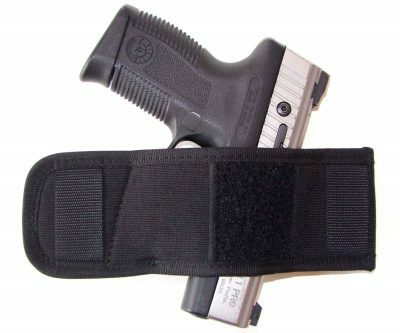 Protect it from dirt and bumps by using our wallet-like GunPouch holster. Disguises the shape of the gun so it looks like a regular wallet, but offers instant access. Made of waterproof, high-tech closed-cell foam padding to protect your gun from moisture. Will carry pistols and double-action revolvers. Lined on both sides with rugged Cordura® nylon for durability and a smooth, fast draw. We use only the finest bonded nylon thread and all stress points are double stitched for extra strength and durability. The Self-Defense Guideline Card! The seven steps you must take to keep you from going to prison if you ever have to use your gun in self-defense. This card reveals, step-by-step, exactly what to do after the confrontation ends and the confusion begins. It contains vital information to protect you! If you carry a gun for protection, you can’t afford to be without this card. Get your card absolutely free, just by trying the GunPouch holster—at no risk to you! Fits my SW 442 perfectly. Snap is strong, as it should be, and the stiff materials preclude sagging. I recommend it. Fits my Kimber Micro 9 perfectly. I love it. Fit my Sig 938 like a glove! Fits my XDS 45. Like it. I like it very simple and protects my gun. I use it while I drive mostly in between car seat and console, when I arrive to my destination put it in my purse and off I go. LOVE these gun pouches to keep my guns organized and clean. I have 8 so far, grab place in range bag and off to shoot. The case is very well made-no question. But, it is more of a one size fits several guns case. As a result, it is loose enough to allow someone to see the gun from behind. Additionally, the flap is too stiff. The entire case could be better fitted to a particular gun model, making it smaller. And, the flap material could be less stiff, allowing it to fit closer to the case. This case may not be discrete enough for some. Store my HK in my nightstand in one of these. Works for me. I have two sizes of these cases – great for storing firearm in car or pack so that it is concealed and protected.